In the post below, I said that I hadn't made any 2008 resolutions, but that there were some on the docket for 2009. But seriously, one of the things that I have set a goal for, more this year than any other, is to choose joy. No matter that Seth learns to undress himself, diaper included, and that there is poop everywhere. I will choose joy. No matter that the power surged yet again and I have to reset all the clocks. I will choose joy. No matter that it is 7:00, and Jim is still at work. I will choose joy. No matter that the moms at the playground are all older than I and don't seem all too interested in me. I will choose joy. No matter that I have to start my home-based business from the ground up again. I will choose joy. It sits next to my kitchen sink, where I'll see it at least a dozen times a day. I know I'll slip up, but that is what's so great about this goal: there will always be a "next time" -- another situation -- where I'll have the opportunity to intentionally choose joy. I LOVE your picture! So, how did you do it? Are they just stickers? I think it's a great reminder... one that I could use myself. 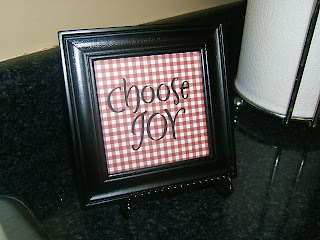 I want to be a woman that chooses joy as well. What a gift to give to those around us as well as a way of worshipping the Lord. I look forward to hearing about all the new things in your life this year. I know that the Lord is going to bless you in ways that you can't even imagine. Look for Him, pursue Him, and love Him with all of your heart... He is there. Happy New Year to you and your family! Love this post...and I'm with you...goal is much better than resolution. Sam! You are remarkable! If it had not been for your e-mail earlier this week paraphrasing my "life lesson" of the past month ~ “Don't give up on God tomorrow, right?” ~ I would have "chosen joy" myself! How did you make the picture? Inspiring! I love your reminder and the thought you put into making 2009 really count in your life!